How do I assign tasks, ideas, or sticky notes? Assigning a task, or sticky note, to an individual ensures that every participant in your Storm knows who is responsible to work on, or follow up on, an item. When you return to your Storm, you'll be able to mark things as completed and follow up on ideas that are yet to be completed. All the sticky notes have this option. 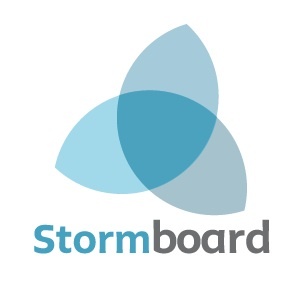 You can only assign stickies to the participants in the Storm. Click the grey checkmark located on the bottom right corner of the sticky. 2. 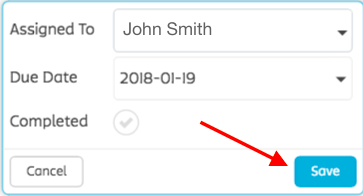 A new menu will open where you can assign the idea (sticky) to a particular participant and set up a due date (you can leave the Due Date set to "No Due Date" if you would prefer). Don't forget to SAVE all changes. The sticky will now have the avatar/initials of the person it has been assigned to in the bottom right corner. The person that you assigned the task to will be notified via email. 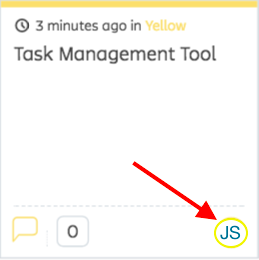 Click on the avatar/initials in the bottom right corner of the sticky/idea you have completed. Click the checkmark next to Completed. Today's date will show (1 below). There will now be a colored checkmark in the bottom right corner of the sticky (3 below). 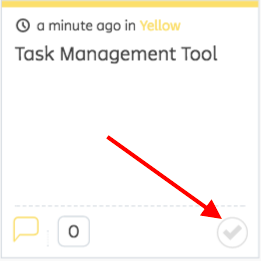 How do I see all the tasks/stickies assigned to me?